Weighty Matters: Can a 15 minute outpatient procedure cure diabetes and obesity? Can a 15 minute outpatient procedure cure diabetes and obesity? You see that's the thing about evidence-based practice, you can't rule anything in or out until you've proven it does or doesn't work. The Endobarrier (that's it up above). Pretty simple concept. Endoscopically place the 2 foot long barrier in the proximal small intestine. In effect this mimics the "bypass" part of the gastric bypass where the proximal small intestine is bypassed by hooking up the new smaller stomach below it. Mechanistically this ought to lead to malabsorption of calories though unlike the gastric bypass I wouldn't expect there to be any dietary restriction or a reduction in the hunger hormone ghrelin though with their add-on "Flow Restrictor" which delays stomach emptying, perhaps there'd be some of both of those effects as well. 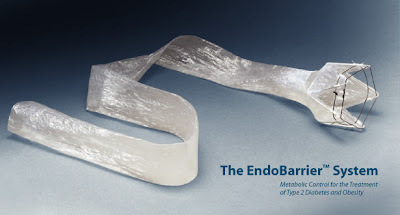 According to GI Dynamics (the parent company), during a 12 week trial 10 morbidly obese patients with the Endobarrier and Flow Restrictor in place lost on average 36.7lbs with side effects including, "mild to moderate abdominal pain, nausea and vomiting." With Endobarrier'ed type 2 diabetics (and no "Flow Restictor"), after a 28 week study their HbA1C levels (a measure of long term glycemic control) went down a remarkable 2.4 percentage points. There's no long term data yet and while it's too soon for me to close up shop, given the ease of placement, the comparatively low cost ($2,000) and the effects to date, I'll be watching the Endobarrier with cautious curiosity.